My friend, Joelle, suggested that I become better acquainted with my slow cooker. I use it 1-2 times a month which I thought was honorable. She owns FOUR slow cookers and generally makes all her meals in her slow cookers (all on the same day, too). I was quite impressed. Now I've realized that my boys have a homeschool coop class on Thursday mornings, homeschooling lessons to complete Thursday afternoon, and soccer practice at 5:30 on the same day. There's definitely not time to prepare a meal unless chicken nuggets and macaroni count. I've decided to become better acquainted with my slow cooker so that my family can have a nutritious and yummy meal waiting for us when we got home from soccer. I'm going to start off Slow Cooker Mondays with a recipe that is already listed here. I thought I'd try a new recipe on Thursdays and then share the recipe on Mondays with you (unless it bombs) and maybe even a picture if it looks appetizing. This recipe is from my friend, Johanna, the Martha Stewart of my life. She got it from her friend who lived in France for several years....could we call it French food? Probably not, but it sure is a family favorite around my house. Place chicken in slow cooker. In pan, melt butter. Add dressing mix, soup, wine and cream cheese. Stir until combined. Pour over chicken. Cook 4-5 hours on low. Serve with pasta. Oh be still my heart!! Suzanne you are awesome. And Amen to the Laundry. If my four could take care of my laundry I would be the happiest women alive. I love this idea. Slow Cooker Mondays! As promised I will get you some of my recipes soon. This week we are eating Harvest Ham Supper, Creamy Chicken and Orange Chicken. The Harvest Ham Supper has been the biggest hit in my house. Its like Thanksgiving in August. Amen Sistah! 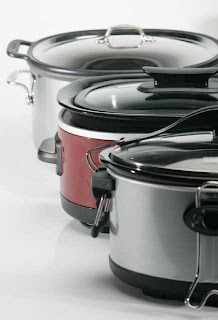 Bring on the crockpot recipes! I have 2 (one is a hand-me down from Dawn V. and the other a gift from my husband) I use the bigger one for meals that I need to double to feed my family of 7. The other one can be for sides/dessert/oatmeal/yogurt and the like. I love coming home from church with a hot meal waiting for us!